News - Tony Bennett leads heartfelt tributes to Frank Sinatra Jr.
Tony Bennett leads heartfelt tributes to Frank Sinatra Jr. The bandleader son of legendary singer Frank Sinatra died unexpectedly on Wednesday (16Mar16) aged 72 after suffering a heart attack while on tour in Daytona Beach, Florida. Family Guy creator Seth was quick to remember Sinatra Jr., who he worked with on the animated sitcom. He wrote on his Twitter page: "Frank Sinatra, Jr. was a friend to Family Guy, and a friend to me. I'm saddened at his passing, but grateful to have known him. RIP, Frank." 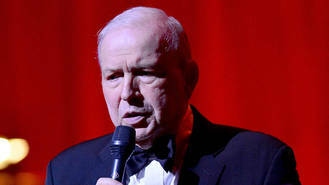 Sinatra Jr. was the son of Frank Sinatra and his first wife, Nancy, and the brother of singer and actress Nancy Sinatra and TV producer Tina Sinatra. Tony Bennett also used his Twitter page to pay tribute, writing: "I am deeply saddened to hear of the passing of Frank Sinatra Jr and send my sympathy to Tina and Nancy and the Sinatra family." Meanwhile, Sinatra Jr.'s one-time stepmother Mia Farrow, who was married to his father from 1966 to 1968, wrote: "RIP Frank Sinatra Jr. Thoughts with his mother Nancy, sisters Nancy and Tina and his son Michael." Larry King tweeted, "I always admired Frank Sinatra Jr. He was born with a hard name to live up to, but I loved his talent and his ability to be forthright," while Jerry O'Connell added on his page, "Rest In Peace Frank Sinatra Jr. CLASS ACT." Sinatra Jr. was close to Dean Martin's daughter Deanna during their lives, thanks to their fathers' involvement in the Rat Pack. Deanna revealed she is "devastated" by his death, adding: "He's one of the good guys". "I am shocked and devastated at the loss of my lifelong friend Frank Sinatra Jr." she told Entertainment Tonight. "He was a brilliant musician, both as a singer and a conductor. He was my Pallie… one of the good guys. My thoughts and prayers are with his loving family." Crooner Frank's son had a colourful life - he was kidnapped and held for ransom when he was 19 in 1963, but he escaped his captors and was found walking the streets of Bel Air, Los Angeles. His kidnappers were later convicted. He worked for years as his father's musical director and conductor, and thrilled sports fans last summer (15) when he performed the U.S. National Anthem at a New York Yankees game.